While counting of the General Elections ballots overshadowed the game, the BVI’s Women’s Basketball team was making history. 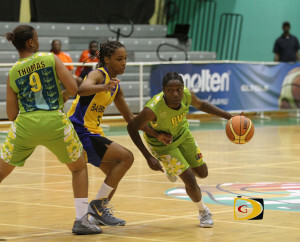 Captain Tamara “Tammy” Phillip scored 28 points as the BVI opened with a 15-4 run, then hanged on to beat Guyana, 64-61, in the Caribbean Basketball Confederation Championships at the Multipurpose Sports Complex on Monday night. The historic victory, came in the territory’s first CBC game, and first time they ever suited up on competition. On Tuesday, the BVI didn’t get off to the start they hoped for and Barbados ran our to a 31-7 lead before they clawed their way out, but their inexperience showed as they eventually fell, 79-49, as both teams records are now 1-1. Barbados was coming off a 75-57 loss to Jamaica. The BVI outscored Barbados 14-8 to pulling within 38-21 at half time. Tiffany Jennings came off the bench to lead BVI scores with 14. Captain Tamara Phillip pulled a game high 11 boards to go with eight points. Barbados’ center Toni Artherley led all scores with 21 and six rebounds. Dale-Marie Cumberbatch narrowly missed a double double with 15 points and nine rebounds. Astrid Alleyne tossed in another 11 to the tally. Brewley called it another great learning experience for his team. Shanae Armbrister scored 16 points to help the Bahamas improve to 2-0, after overcoming a 40-27 deficit to St. Vincent and the Grenadines, during a 62-54 triumph. Diasti Delancy added 13. The Bahamas used its bench out score St. Vincent, 21-4 and stayed in the game with a 16-2 edge in fast break points. The Vencentians fell to 0-2 with the loss. Sheleen Joseph who played all 40 minutes, top scored with 19 points. Lorna Caesar dropped in 11 and center Vasha Adams, 10. Bahamas beat the USVI, 67-63 in it’s opener. Jamaica’s Tarita Gordon dropped in 23 points during a 70-43 victory over Guyana. Yanique Gordon followed up with 15. Guyana’s center Mariam McKenzie poured in a game high 24 points and pulled 13 boards. Brittney Matthew scored 17 first half points to help the U.S. Virgin Islands overcome an early Antigua and Barbuda first quarter lead, and they dominated the game to even their record at 1-1 with a 94-31 victory. Matthew who played 17 minutes and 57 seconds of the first half, converted three of her six 3-pointers as the USVI controlled the game to lead for 18 minutes and built a 37-16 halftime lead. Matthew who was on her game, opened the third quarter with a 3-ponter and shot 50% behind the arc for the game, triggered a 27-10 run in the period that ended 64-26 in the USVI’s favor. They outscored Antigua and Barbuda 30-5 in the final period.